In this blog post we present the poignant volume ‘Reconstructions – The Troubles in Photographs and Words’. 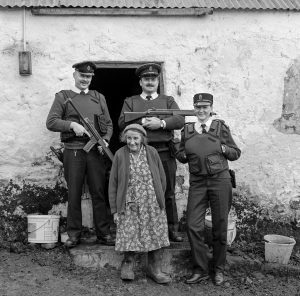 It is a rare work that combines photographs and poems, capturing and blending personal and collective memories of the Northern Ireland conflict. The photos are by world-renowned photographer Bobbie Hanvey who took some of the iconic photos of the Trouble’s defining moments. 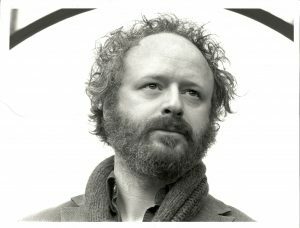 The poems are by his son Steafán Hanvey, who is a singer-songwriter and poet. We invited Steafán to write about his own relation to memory and art and how it speaks to the memory politics of Northern Ireland. Below, in his blog post, he notes that his father’s photos acted ‘as portals, not only to the past but to the future’. At the end of the post there are links from the audiobook to three of the gripping prose-poems read by Steafán Hanvey, each linked to Bobbie Hanvey’s powerful pictures. We are very happy and grateful to be able to introduce this work in the context of our research into multi-layered memorywork. 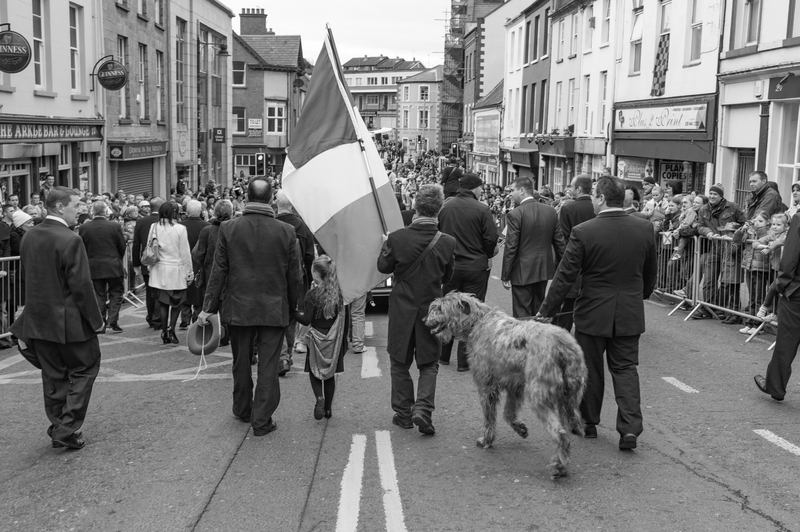 I slipped into this world between Bloody Sunday and Bloody Friday – on June 22nd 1972 – the same day the IRA considered calling a ceasefire if certain conditions were met; but it wasn’t to be, and the conflict raged on for the next twenty-odd years of my life. Fast forward to the IRA ceasefire in 1994 – my final year at university – and I’m working as a sound-engineer for a production company in Belfast. Somewhat ironically, for it wasn’t until then – with the Troubles next to over – that I decided to up and leave Northern Ireland for snowier climes in neutral Finland. My intention was to never look back, and I didn’t, at least not until almost two decades later when I set about writing and recording my second long-play record, Nuclear Family. This intensely personal album forced me to begin sifting through my memories and experiences. I soon realised that the public and political face of Northern Ireland was pressed hard against the window of my private and personal world. In short, my family couldn’t be explained in isolation. After years of ‘whatever you say, say nothing’, I felt the time was nigh to say something, so I ceased ‘houling my whisht’. As an artist, that something had always troubled me, and making Nuclear Family made me realise that though I had never written explicitly about Northern Ireland, Northern Ireland had, in fact, written me. As memories, like words, can be as slippery as a new-born child, I opted instead to configure Reconstructions as a series of ‘impressions’, and like Nuclear Family and Look Behind You!™, it too would investigate and promote the notion that ‘The End of Art is Peace’. Together, they would form a notional triptych – complementary panels that told a similar story in different ways. And so, I started to revisit some of my father’s iconic photographs from the Troubles, with the intention of producing a poem for each. The photos acted as portals, not only to the past but to the future, dragging me back and propelling me forward as each recollection qwertied onto the computer screen. I was present at the conception of many of the photographs. I witnessed their act of becoming, and marvelled as they developed lives of their own in chemical trays and beyond. Often depicting disgraceful acts, they nonetheless graced the pages of many national and international publications. Their brutal candour made sure of this. My da conceived these photographs and I hope that my words do them and their taker — my fathographer— the justice they deserve. I also hope that in my presentation of each ‘reconstruction’ that I have afforded the less-fortunate — those who lost their lives, and those who were hurt and are hurting still — their due respect. Below follow three photographs and poems (on audiofile) from Reconstructions – The Troubles In Photographs and Words. 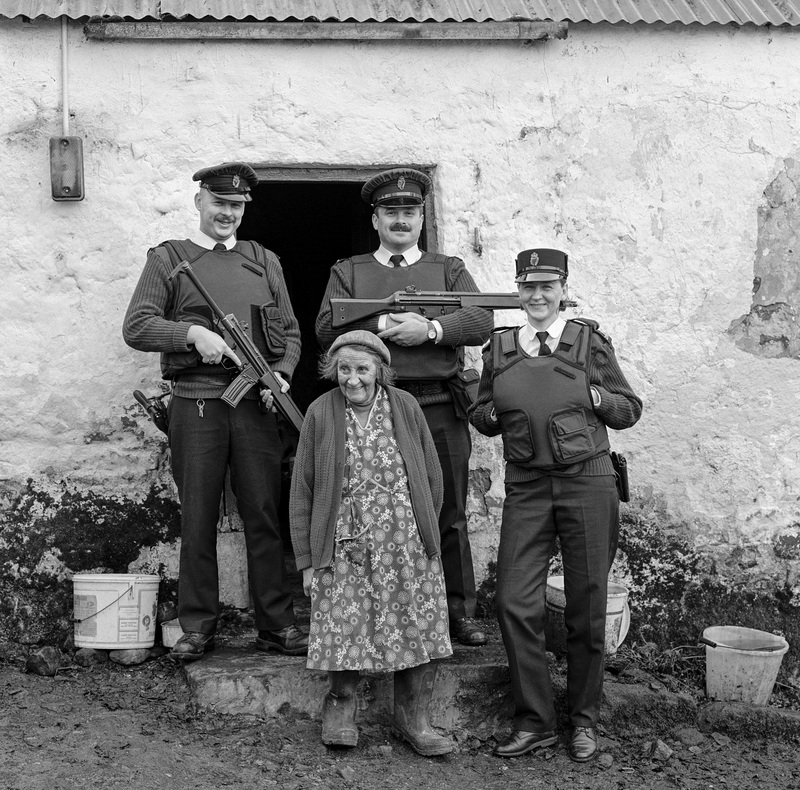 (The lady in the photograph was called Sarah Primrose, here with a RUC neighborhood watch patrol). 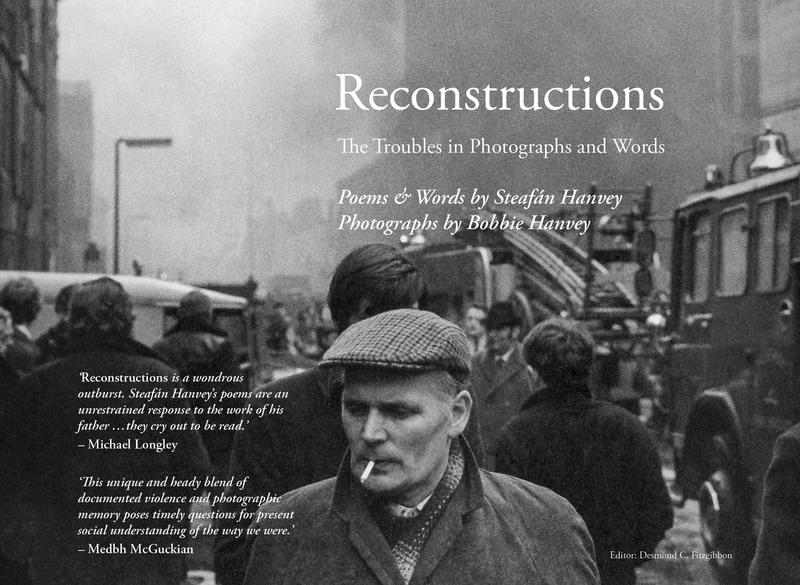 Reconstructions – the Troubles in Photographs and Words hardback and e-book formats are published by Irish Academic Press/Merrion Press. The Photo-Poetry Audiobook is distributed by INgrooves. Bobbie Hanvey’s photographs appear courtesy of the © Bobbie Hanvey Photographic Archives, John J. Burns Library, Boston College (Cambridge, MA), and the trustees of Boston College. We are delighted to welcome guest blogger Maja Davidovic to our website. Read her thoughtful piece on the promise of ‘Never Again’. She asks: what are Bosnia and Herzegovina’s or any other state’s obligations to provide (or offer) guarantees of non-recurrence after a conflict? Where do these obligations originate from and, importantly, do local people act as consultants in these processes? These questions touch upon some core issues to do with memory politics and peacebuilding. 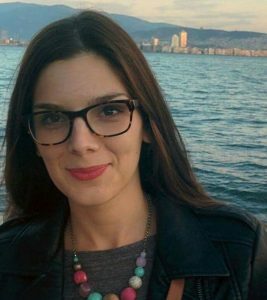 Maja Davidovic is a Ph.D. candidate at Durham University working on guarantees of non-recurrence in transitional societies. She is an alumna of the Human Rights M.A. program at Central European University and has previously worked with migrants and refugees as a researcher and field officer in Serbia, Bosnia and Herzegovina, and Greece. The Promise of ‘Never Again’: How do states guarantee non-recurrence? 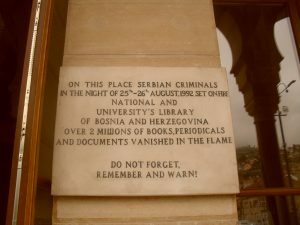 Twenty-three years after the Dayton Agreement, these three quotes are only a few among many statements inspired by the ‘Never Again’ promise that regularly appear in different media sources in former Yugoslav republics. Gross violations of human rights, war crimes, crimes against humanity, and genocide all took place in Bosnia and Herzegovina (BiH) during the four bloody years between 1992 and 1995. Although today the country is known for its ethnic divisions, all ethnic groups seem to agree that these crimes are neverto be repeated. ‘Never Again’ is not merely a promise, it is also an obligation. The principle of non-recurrence is a promising one, not only among the political elites in former Yugoslavia but also in transitional justice (TJ) and peacebuilding. Guarantees of non-recurrence (GNRs) have repeatedly been underlined as one of the pillars of transitional justice while understanding the root causes of conflict, a pre-requisite for GNRs, is essential for the building of a sustainable peace. Yet, very few in these fields have asked, what exactly are these guarantees? Who determines them? Who are they for? How have they been applied? The truth is, scholars have produced very little knowledge to effectively answer to any of these questions. As someone who was born and raised in Serbia, worked in Bosnia and Herzegovina and has had a chance to observe the two countries from abroad, I am not aware of any guarantees my country has put in place to assure me that it will never commit crimes against humanity again. Likewise, my colleagues in BiH, some of them of Croatian heritage, others Serbian, Bosnian Muslims, or none of the three, do not necessarily feel like any of their legislators, politicians or policy-makers have done much guarantee that they will not go to war with ‘the Other’ again. Nearly a year ago, during my field visit to BiH, some local residents drew rather realistic parallels between the on-going migration crisis and the conflict. They said they have been re-living their war traumas again by seeing hungry and poor women, men, and children sleeping in tents, inhabiting local parks, fleeing war. Their fears of recurrence keep the memory of the war vivid and trauma-prolonging and they are not entirely unreasonable. Ethnic tensions in the region remain at an unsatisfactorily high level and have only gotten worse in the attempts to deal with the thousands of incoming migrants earlier this year. As a researcher, I had to wonder: what are BiH’s or any other state’s obligations to provide (or offer) guarantees of non-recurrence after a conflict? Where do these obligations originate from and, importantly, do local people act as consultants in these processes? Researching public international law sources, the jurisprudence of international human rights courts and UN soft law sources shows that there is no consensus on what the legally enforceable guarantees of non-recurrence are. In the view of Pablo de Greiff, former UN Special Rapporteur on TJ, numerous measures such as education, trauma counselling, and the empowerment of civil society can be GNRs. Yet, these largely non-legal measures greatly depart from the standards set in public international law and, to some degree, even the UN-made soft law. GNRs were known as consequences of diplomatic disputes, dating back to the late 19thcentury. In the LaGrand case involving Germany and the United States, the International Court of Justice (ICJ) declared for the first time that GNRs are a right of the injured state and that both specific and general guarantees can be state’s obligations however refusing to specify any concrete measures in its later decisions. In the 2005 United Nations Basic Principles and Guidelines on the Right to a Remedy and Reparation, published, however, GNRs are a type of reparations, just as compensation and satisfaction. GNRs can include ‘any or all’ of eight measures, including protecting legal professionals, promoting the observance of codes of conduct and ethical norms, and reforming laws that could allow for gross violations of human rights. Similarly, GNRs have been considered as reparations by regional human rights bodies, most notably the Inter-American Court of Human Rights which, inter alia, ordered Guatemala to adopt human rights and humanitarian law norms in its domestic law so that systemic violations do not happen again. This ongoing normative study of guarantees of non-recurrence in international law shows anything but great discrepancies, which are reflected in practice. It is hard to comprehend how transitional justice scholarship has managed to argue that being forward-looking and promoting non-recurrence are its core mandates without a) fully comprehending what sort of non-recurrence a state has an obligation to offer, to whom, and by which means and b) looking more deeply into what states emerging from conflict have done in this regard so far. The recent editorial piece by McEvoy in the International Journal of Transitional Justice, pinpointing to how unexplored this pillar of transitional justice is and stressing the need for further research is a welcoming confirmation of my concerns. GNRs essentially aim to transform the status quo that led to the violation, crime, or genocide and aid a lasting peace. That said, if transitional justice can promote a set of tools that aim to reach the objective of non-recurrence, this could actually help the field be transformative, while at the same time being reparative. What the scholarship needs is more knowledge of ‘Never again’ practices by those whose obligation it is to ensure non-recurrence and more decoding of the complex web of relationships that can jointly fulfil the promise of non-recurrence or else the transformative (and forward-looking) agenda of transitional justice may remain a purely abstract construct. At the next stage of my research, I will migrate to Bosnia and Herzegovina to understand what these multiple actors have done, been wanting to do and how they have struggled. How have transitional justice mechanisms assisted them in this mission? Most importantly, have any of these measures been adopted and implemented in consultation with local populations? For, in the end, it is their lives and realities that seek transformations in order to, once and for all, heal, remember, and move forward from perpetually looking back. Maja Davidovic is a Ph.D. candidate at Durham University working on guarantees of non-recurrence in transitional societies. She is an alumna of the Human Rights M.A. program at Central European University where she did research and published on gender and enforced disappearances and reparations. She has previously worked with migrants and refugees as a researcher and field officer in Serbia, Bosnia and Herzegovina, and Greece. In October, Professor Susanne Buckley-Zistel organized a conference on the theme of Space in Peace and Conflict. All members of this research cluster participated. Susanne Buckley-Zistel moderated the opening panel on ‘Interdisciplinary Spaces’, Stefanie Kappler, Johanna Mannergren Selimovic and Timothy Williams participated in a panel on ‘Spatialising Memories’, and Annika Björkdahl held the closing keynote entitled ‘A Spatial Turn in Peace and Conflict Research’. In 12-15 September 2018 we all participated in the 12th Pan-European Conference on International Relations in Prague, organized by EISA, European International Studies Association. We organized a panel on the theme of ‘Memory, Materiality and the Cultural Heritage of Conflict’ and Professor Annika Björkdahl participated in a roundtable on the theme of ‘Memory and the Politics of Hope’. The War Childhood Museum on Logavina 32 in Sarajevo is a new and important contribution to the ambiguous and fragmented memoryscape of Bosnia-Herzegovina. It is located close to the Baščaršija, Sarajevo’s old bazar and the historical and cultural centre of the city, yet hidden away, on a steep street and not easily found without a map. 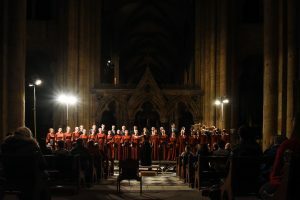 It focuses exclusively on memories of children affected by war. The museum provides a careful selection of young memories describing war through the eyes of children. Through memories, testimonies, snippets of texts and video narratives, fragments of everyday life in a war zone are pieced together and as visitors we are transported back in time to the war in the 1990s and to the siege of Sarajevo. The Museum started off as a project by Jasminko Halilovic to collect children’s experiences and memories of growing up during Sarajevo’s Siege. 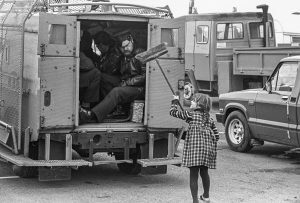 More than a thousand of these children, now adults and scattered around the world, responded to the call and shared their recollections and narratives, which were compiled in the book War Childhood, published in 2013. One such narratives reveals the irony of children’s play. In addition to collecting the stories of war childhood, memorabilia from these childhoods such as extracts from a diary, a sad-looking, mangy teddy bear, a carefully knitted vest, a young ballerina’s pointe shoes, and a favourite book were donated making up the objects on display in the museum. In the exhibition, every artefact is accompanied by a unique personal story. My brother’s “children’s police” badge is a short story shared by a sister who lost her brother in the war. 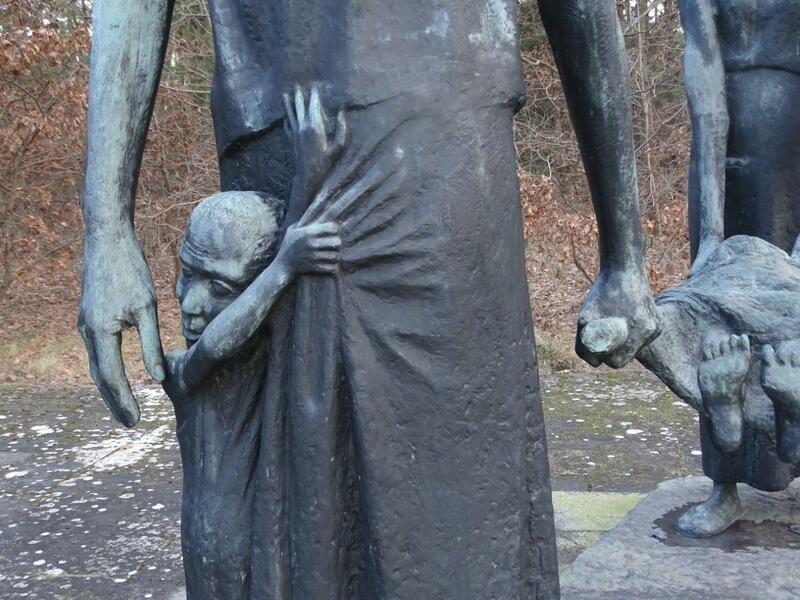 Viewing the war through the memories of those who experienced it as children is powerful. The museum is overwhelming in many ways; it is backward-looking, recalling a difficult past, yet forward-looking and hopeful, it is sad and traumatic yet it reflects glimpses of children’s play, cooping ability, fun and wry humour. It is reflexive as it provides visitors from near and afar to confront the war traumas of the recent past. It holds a timeless wisdom, important messages, and it sharpens the eyes to the unique experiences of children in war zones. In a society divided along ethnic lines it is reflexive, reconciling and forward-looking to establish a museum that avoids reinforcing ethnic boundaries and that belongs to everyone. 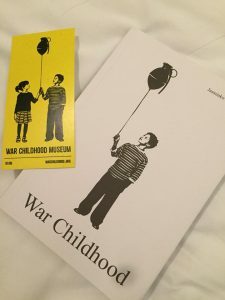 By exhibiting children’s memories, artefacts and narratives of war this museum holds the potential to give voice to war children of the past and the present. Halilovic, Jasminko (2017) War Childhood. War childhood Museum, Sarajevo. 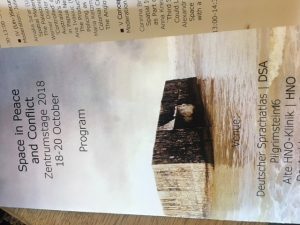 Stefanie Kappler participated in the conference Troubling Histories: Public Art and Prejudice in South Africa and presented the paper Post-Conflict Curating: the Arts, Audience and Politics of Belfast’s Peace Walls” (with Antoinette McKane). Murdered Jews of Europe, to name but a few. Berlin’s memorials also pay tribute to moments of resistance, such as the German Resistance Memorial Center, or to perpetrators such as the Topography of Terror, adding to the diversity of the memoryscape. These photos from a recent visit convey the kaleidoscopic array of different memorial and education attempts which compete and coalesce in remembering the Nazi past.